Jon managed to sit down Trace, Mason and Anthony from the electro/pop outfit Metro Station ahead of the UK release of their debut self-titled album at the end of March. The band spoke to Alter The Press about their album finally being released in the UK, touring with Good Charlotte, their upcoming support slot with Fall Out Boy, the new 'crunk/screamo' genre and soccer moms working out to 'Shake It'. Alter The Press: The last time you were in the UK was supporting Boys Like Girls, how was it? Trace: That tour was amazing! It was our second time here; our first was with Panic At The Disco. That was everybody’s first time to hear about us, the kids were dancing to our songs but didn’t really know the words to our songs and then coming back was so overwhelming with kids singing every word so there was not one bad night and every night was as crazy as the first. We had a blast! ATP: What was the best show of the tour? Trace: Every night was good but we loved London for sure. ATP: How would you compare your English fans to your American fans? Trace: It’s totally different. America gets to see us a lot more so when we come over here, kids go a lot crazier. It’s exciting. ATP: Have you had any down time at all since coming here to check out anywhere in particular? Trace: Not really. We never really have a day off when we’re travelling; it’s just one concert after another. ATP: How does it feel that you’re album is finally being released in the UK? Trace: It feels good! It’s finally being released; it feels like it’s taken forever. We feel like our music definitely fits it over here in places like the UK and Europe. It’s a good feeling that we are from the other side of the world and to come over here and see this much love. The album is finally going to be in stores, which is great. ATP: The album was released in 2007 in the US. Do you feel like the album has run it’s course already or do you feel like a lot more work is still yet to be done? Trace: I feel like we haven’t conquered the rest of the world and we definitely have done our fair share of travelling across America but we worked a long time on this album and want as many people as possible to hear it. ATP: In 2006, you did put out the ‘In Questions We Ask At Night’ EP. The majority of the songs on the debut record are taken from the EP. Are you not bored of playing any of the songs already? Trace: You know every time when you go out on stage; it’s a new crowd and a new city that you’re playing to every night. It never gets old. It’s a new different environment and every night is a different kind of excitement. Anthony: I was the last guy to join but they were a band for six months already and had wrote the album in 5-6 months so it’s not a band that’s had material for five years, they wrote it really quick so it’s still fresh. ATP: Was there a reason why a few of the tracks from the EP didn’t make the final cut to the album? Trace: To be honest, we didn’t have much of a choice. We had a ten-song limit for our first album and we chose the best songs that represent Metro Station. ATP: Do you have plans for a new record? Mason: We are always writing music. That’s what we do. Trace: We don’t know when we are going to get time off and get back in the studio but Mason is always working on his computer, I’m always writing in my spare time and we are always trying to make new music. When the time comes to make a new record, it’s not going to be a challenge for us. ATP: You’ve already been on some big bills already with bands such as Good Charlotte, Panic At The Disco and Simple Plan. What has been your favorite tour? Trace: By far, my favorite tour had to be with Good Charlotte. Benji and Joel (guitarist and vocalist of Good Charlotte) and the rest of the band are the nicest down to earth dudes and after the years of doing this, we hope we are as down to earth and as normal as them. It was weird because Joel was a big Metro Station fan before we even met him. By the time we met him, he knew the words to every one of our songs and within the first week of the tour, Joel was coming out and performing with us on one of our songs. It felt so unreal and crazy. Anthony: We have toured with a lot of bands but those guys are so sincere despite how famous they are. 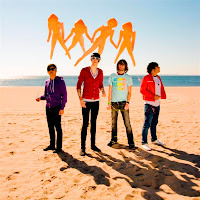 ATP: When you go back to the US, you’ll be touring with Fall Out Boy, Cobra Starship, All Time Low and Hey Monday. How did you get booked on this tour? Trace: It’s all management really. We are on Ozone management, which is a part of Crush management, and we’ve played shows with Cobra Starship, All Time Low and Hey Monday already. Mason and I have met Pete (Wentz – bassist of Fall Out Boy) and the rest of the guys a couple times and it all worked out. ATP: There was criticism from fans when you guys got announced on that tour. What is your response to that? Anthony: We get that a lot. Trace: Comments on the Internet doesn’t really concern us in anyway. We look at the bigger picture in life. Mason: We are going out on a Fall Out Boy tour because yes we love the bands but at the same time, if you had to ask me the question if I wanted to play in front of 20 people or 20,000 people? I would want to play in front of 20,000 people. Why not reach as many ears as you can hear? If they like it, they like it, if not whatever. ATP: 50 Cent has just been announced he will be playing a few dates too. How do you see that panning out? Trace: We are very excited. All I listen to is hip-hop and rap. I’m a big 50 Cent fan so I’ll be freaking out. Mason: I think it’ll bring a different dynamic to the tour. Anthony: On our headline tour, we brought out a hip-hop artist, Tyga. Trace: He was main support for the whole tour and we ended up being better friends with him hardly any band we’ve toured with. Nowadays, kids love all types of music, especially in America. I don’t think it’s going to be a problem at all. ATP: Touching on this. In the US, a new genre of music blending rap/crunk with screamo has evolved with bands such as Brokencyde and Hollywood Undead. What is your take on this? Mason: When Hollywood Undead came out, Trace and I we’re driving around LA listening to them. I don’t know really, I love their stuff but when the album came out I was like, what happened? Who knows, a few songs on there are awesome but I could be wrong, but I think they could have taken a wrong turn. It could have been that they could have got too big too fast on the Internet but I think their style of music works. Kids like it. ATP: If you could tour with any band, who would it be? ATP: When is any of ‘From Backseats To The Bedroom’ (Trace’s clothing line) going to be released? Trace: In the next couple of months hopefully, I trashed the first designs so it will happen in the future. My main focus in life is Metro Station and that is just a side fun project for myself. Anthony: We do a lot of our own designs like for our t-shirts and MySpace page. We do it all ourselves. We like to focus on that. Trace: When we started out, we never thought we would be as massive as we are now and it was stuff we had time to do back then when weren’t doing press and travelling all the time. ATP: If you had to sell a copy of your album to a music fan, what would your sales pitch be? Anthony: 'It’s a good album to drive to'. Anthony: It’s played at the gyms a lot! Trace: A lot of soccer moms like to ‘Shake It’ (debut single) at the gym! Mason: Lets keep the moms happy and young looking! ATP: What does the future hold for Metro Station? Mason: Keep going for as long we can. Anthony: We feel like, how it’s going international with ‘Shake It’, we are now travelling a lot more. The work we did in the US before, we are now doing it in every other country. This is what we want. Trace: We want the same success in the United States as everywhere else. ATP: Any plans on coming back to the UK? Trace: We don’t know but I’m sure we’ll be back soon shortly after the Fall Out Boy tour. We have to come back with the album just coming back. Mason: Later this year probably. Metro Station's debut self-titled album is out March 30th on Columbia Records.